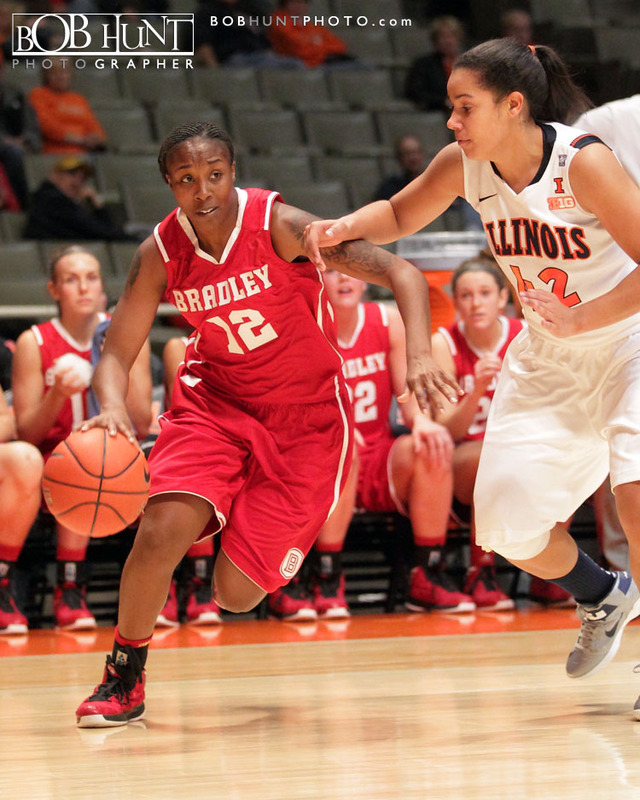 Junior Michelle Young scored a game and career-high 32 points to pace five Bradley University women’s basketball players in double figures as the Braves topped Illinois 98-92 Friday afternoon at Renaissance Coliseum. 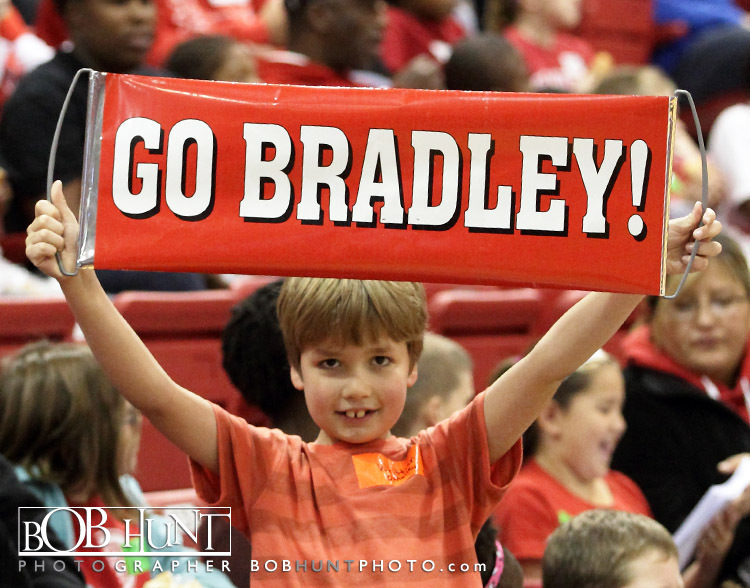 The crowd of 2,402 fans, which ranks as the fourth-best attendance total in school history and largest for a women’s basketball game at Renaissance Coliseum, left entertained as Bradley’s 98 points surpassed the previous arena mark of 96 points in a win against Iowa on Dec. 17, 2001 and the teams combined for a Renaissance Coliseum record 190 points. 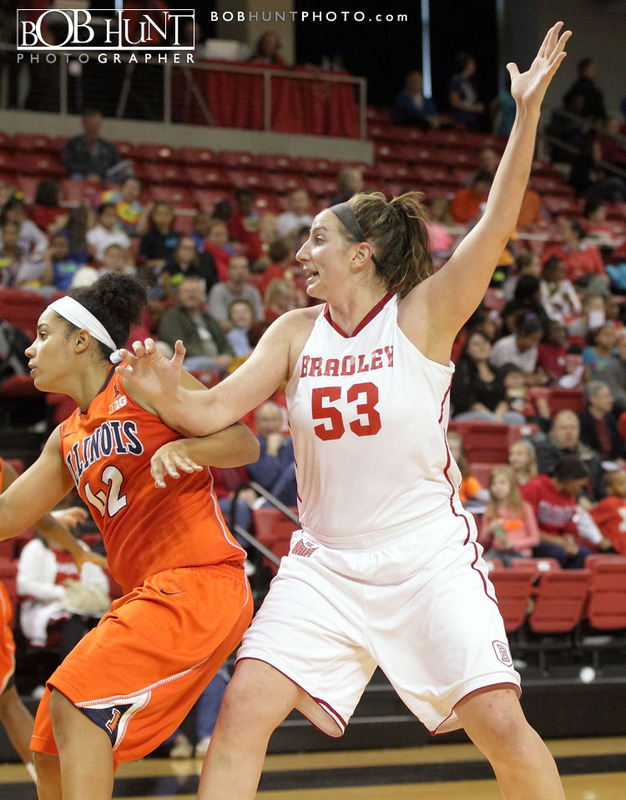 Bradley (1-0 overall) improved to 3-1 in its last four contests against Big Ten Conference foes and the Braves are now 3-2 in the last five matchups with the Illini. 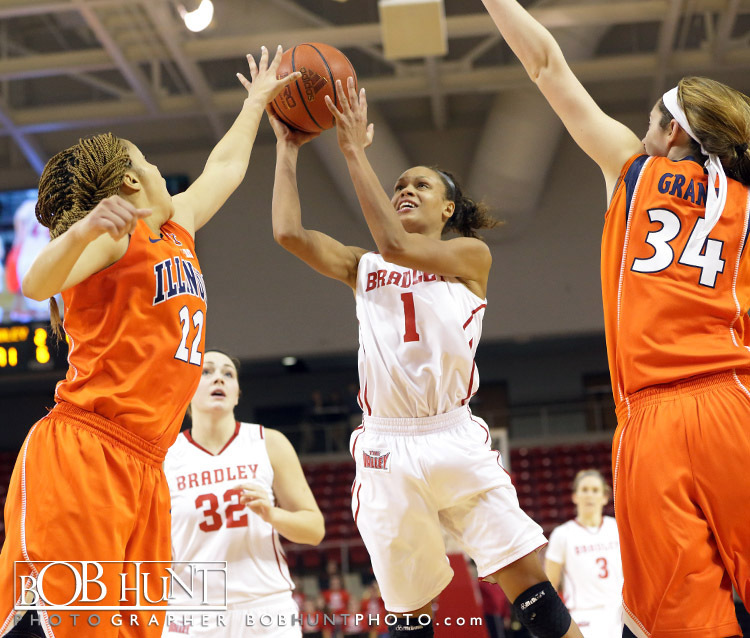 The game marked the first season opener against the BCS Conference foe for Bradley since the 1999-2000 season and the Braves topped a BCS Conference opponent to open a season for the first time since 1998-99. 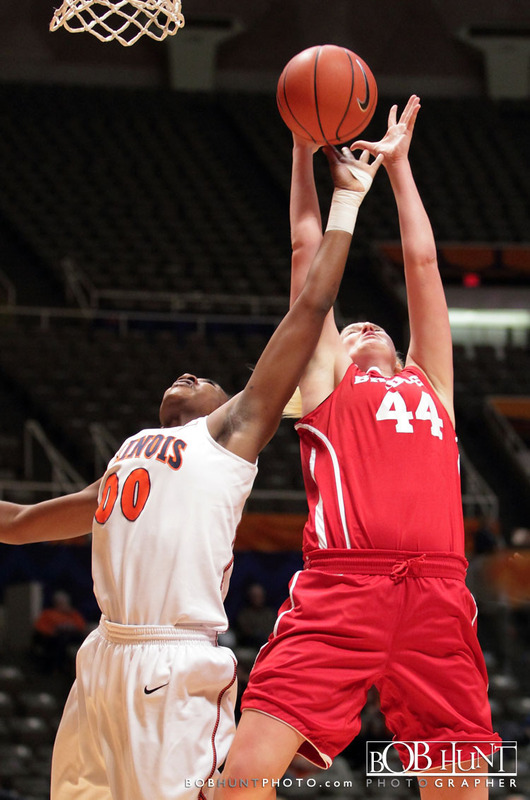 Young scored 19 of her career-best 32 points in the first half, including 13 points in a seven-minute span, and made 11-of-19 field goal attempts on the afternoon. 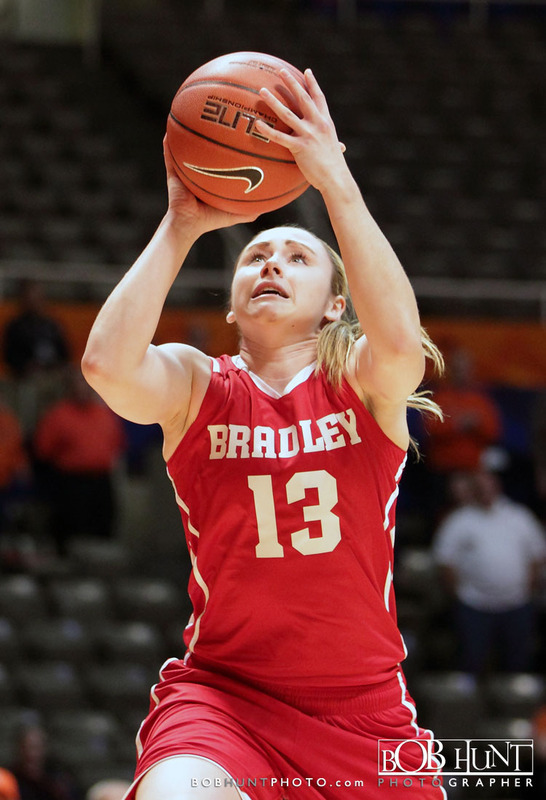 Her 32 points are tied for the eighth most in school history and were the most by a Bradley player in a home game since Genny Mueller had 33 points against Indiana State on March 6, 2004. 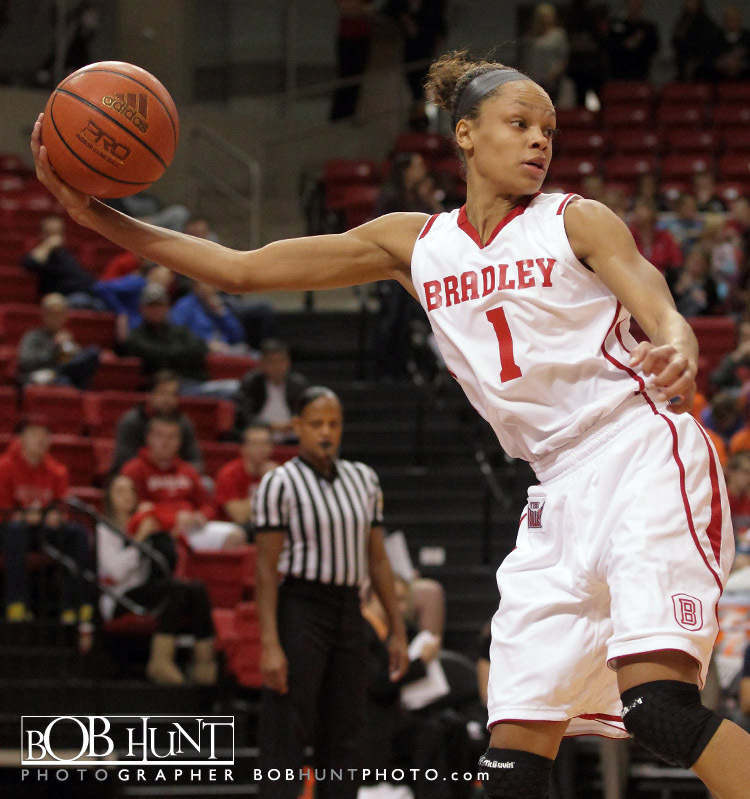 Young’s point total also ranks as the most points scored by a Bradley individual in a season opener. 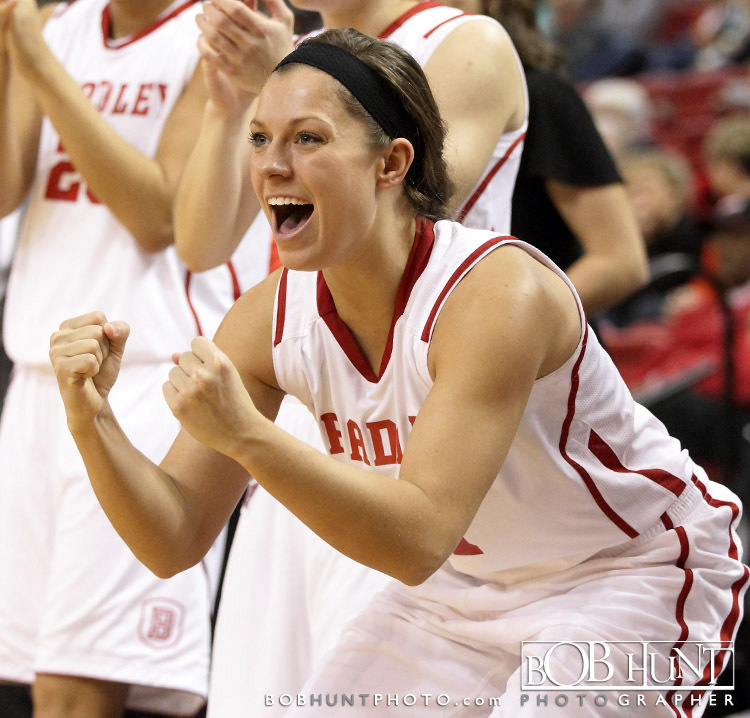 All four Bradley seniors finished in double figures, Kelsey Budd added 23 points, seven assists and a career-best eight steals. 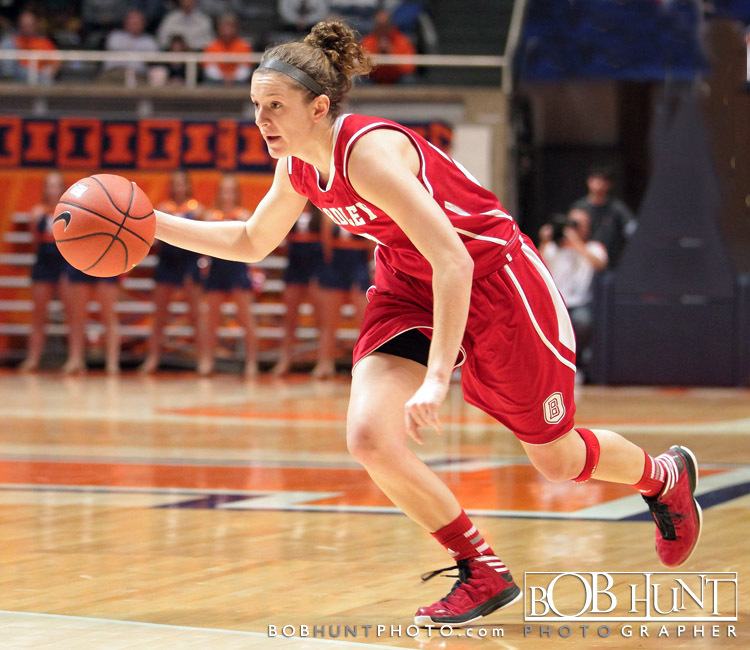 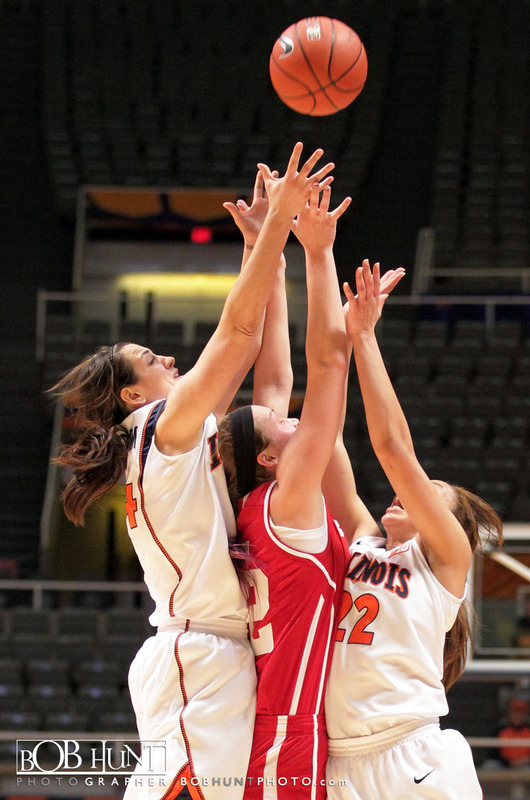 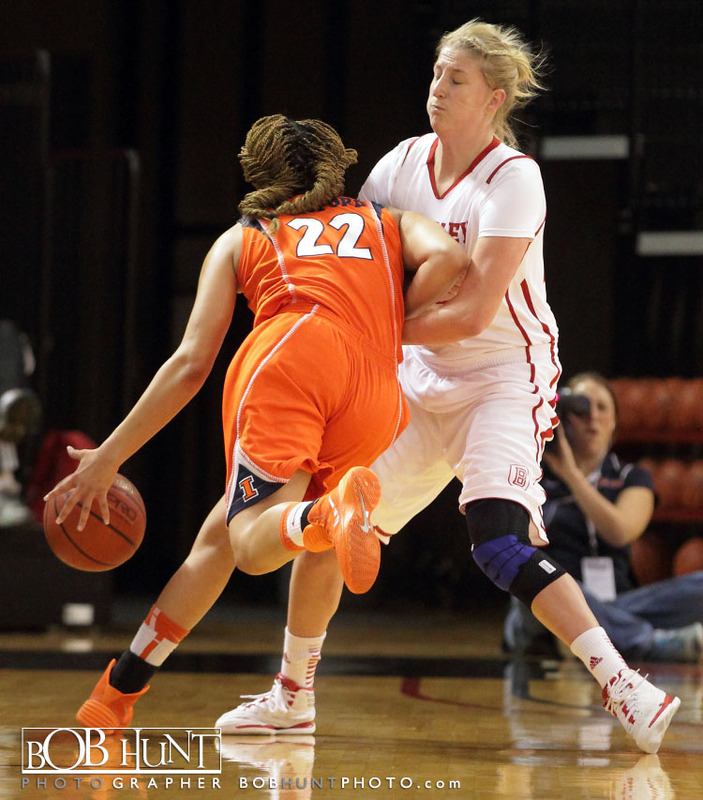 The eight steals are the most by a Brave since Skye Johnson had eight takeways against Creighton on Feb. 23, 2008. 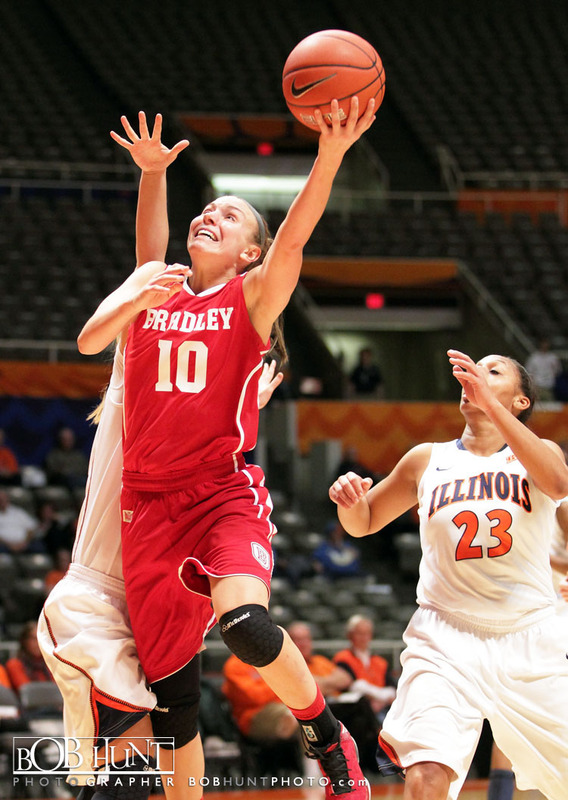 Bradley got off to a hot start, shooting 62.1 percent in the first half; including 7-of-8 on three-point attempts to jump out to an early lead, and never trailed in an 83-77 victory at Illinois Thursday at Assembly Hall. 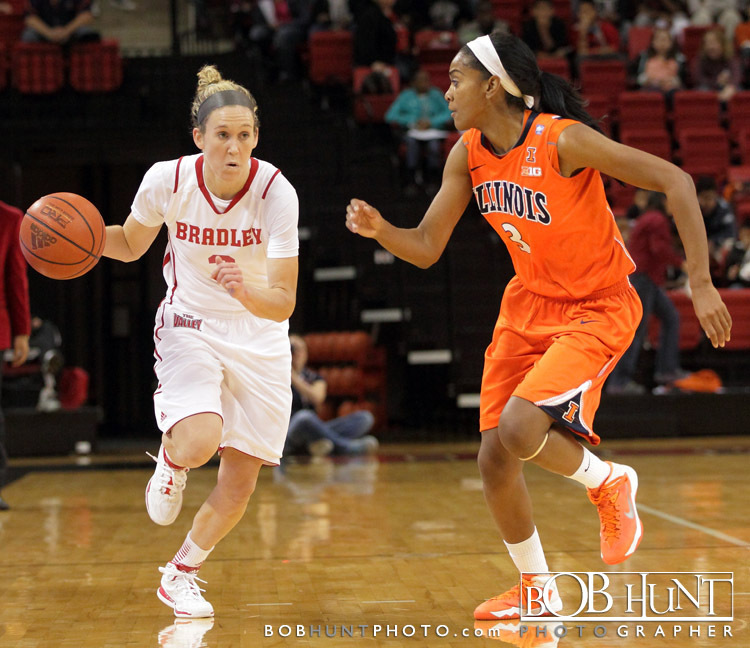 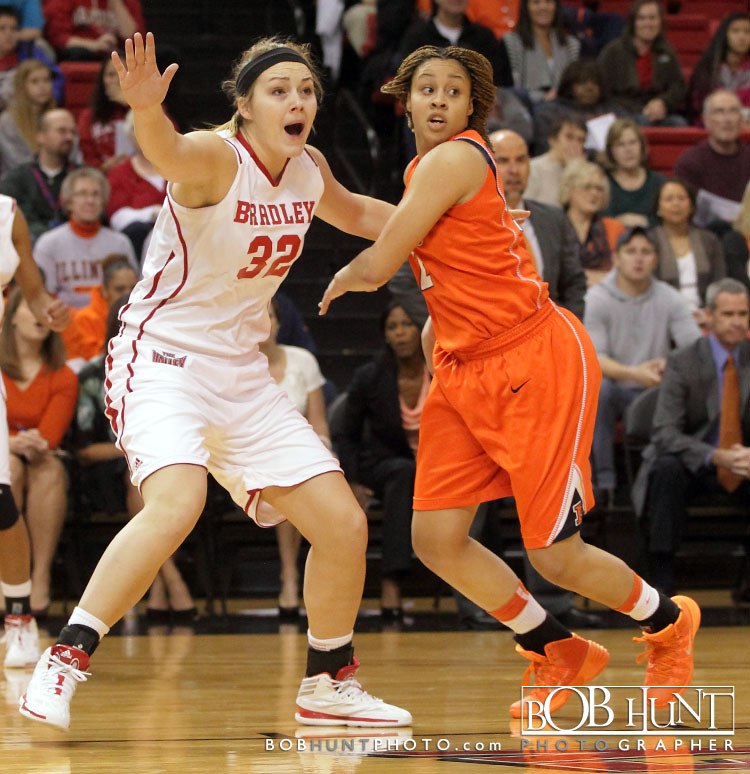 Five Bradley players scored in double figures, paced by Catie O’Leary and Shronda Butts with 15 points each. 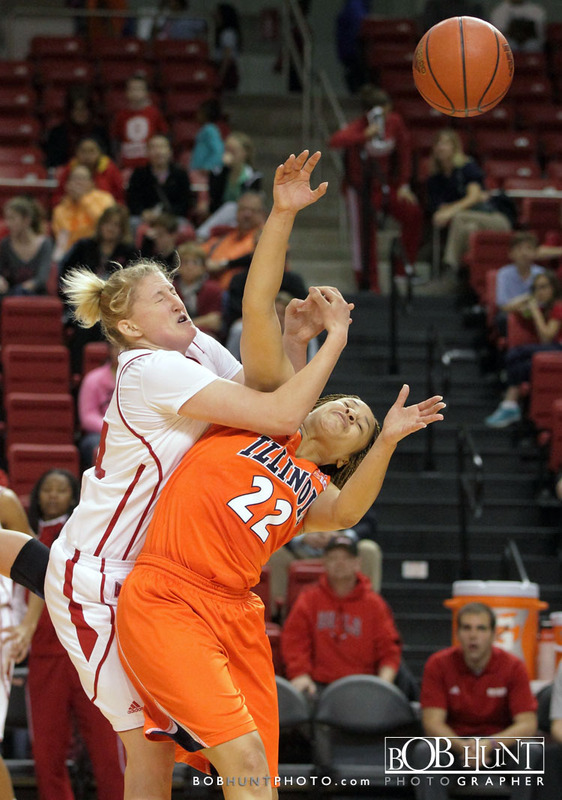 O’Leary matched a career-high with 12 rebounds for her first double-double of the year. 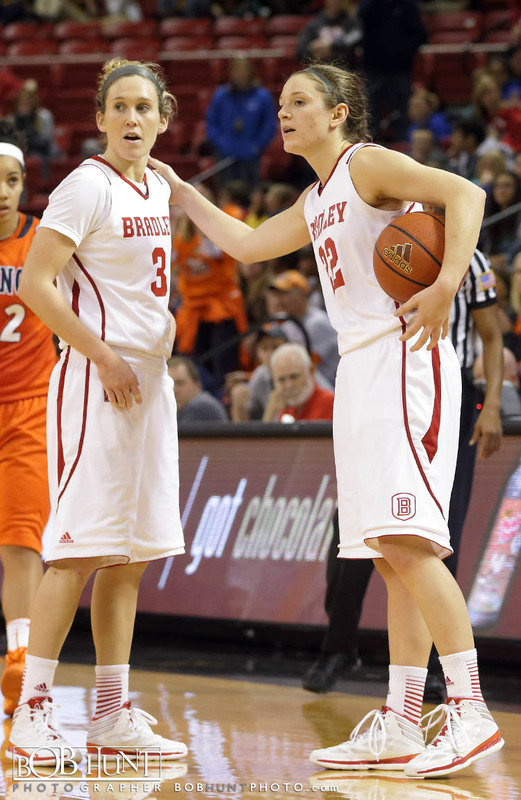 Senior Katie Yohn went to the locker room with 9:42 remaining in the opening period after taking an elbow to the eye with BU holding a 23-19 advantage. 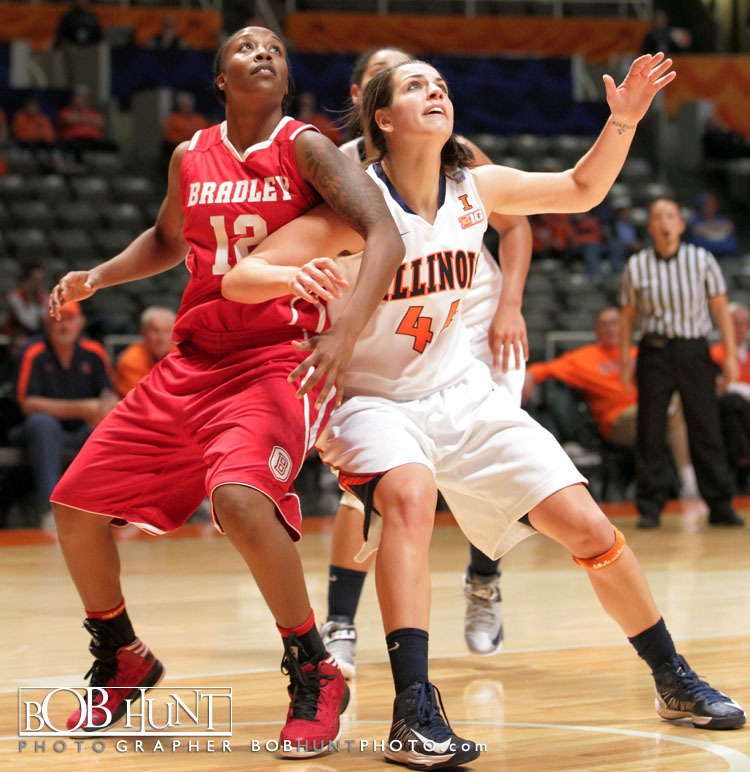 Following the Yohn injury, Butts made three of four free throws on an Illinois intentional foul and subsequent technical foul to extend the lead to 26-19. 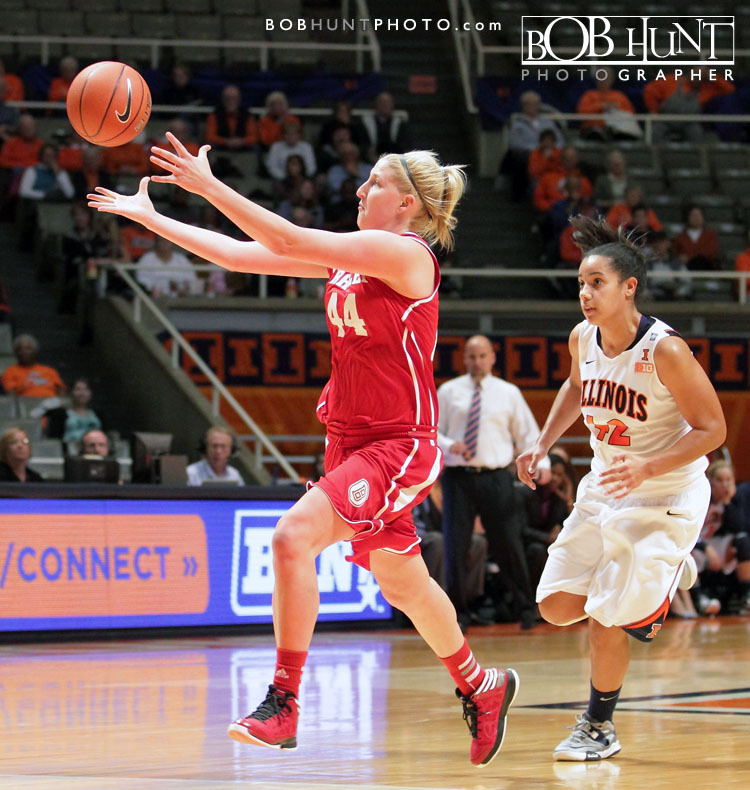 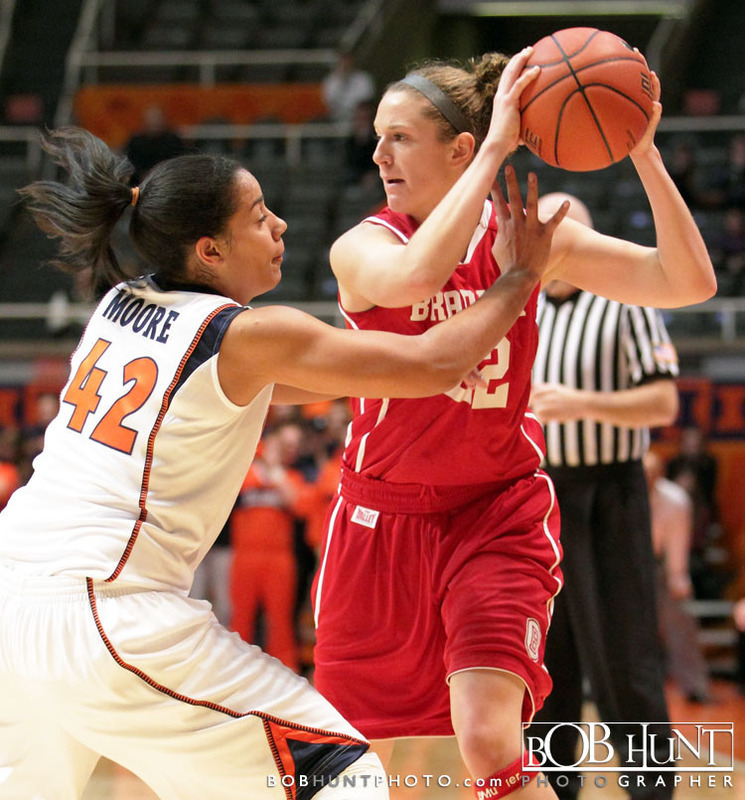 The Braves pushed the lead to as many as many as eight points (29-21), before a 9-2 Illini spurt trimmed the advantage to 31-30 with just under five minutes. 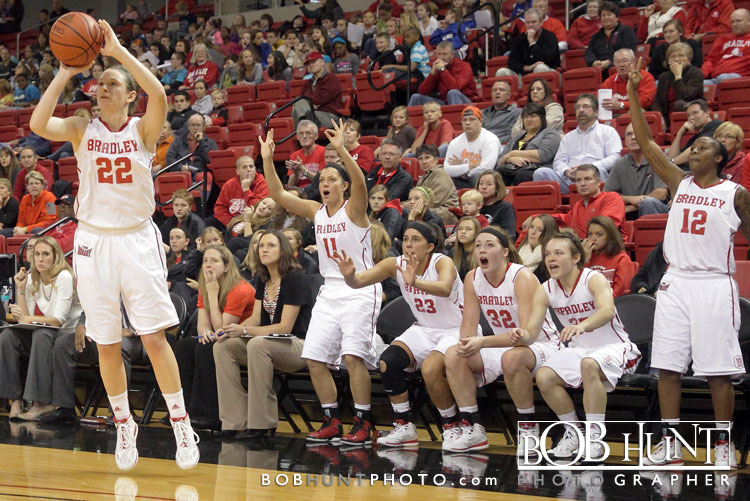 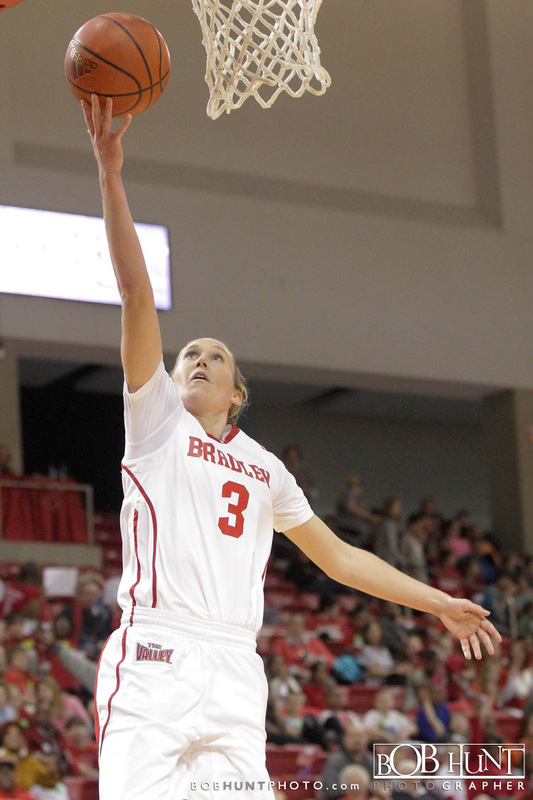 Freshman Jenny Smith hit a pair of three-pointers down the stretch and Bradley took a 48-43 lead into the break. 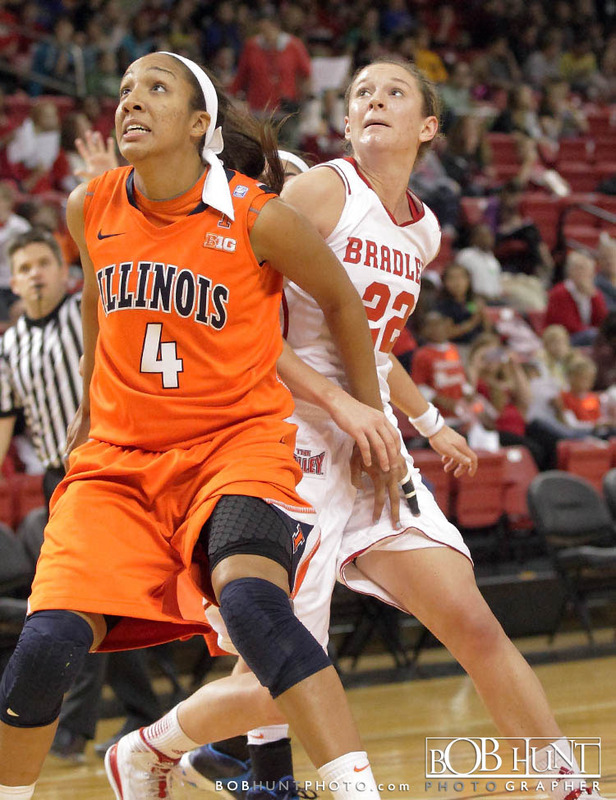 Karisma Penn led the Illini with 29 points and 16 rebounds, with Ivory Crawford making 9-of-17 shots and collecting 18 points. 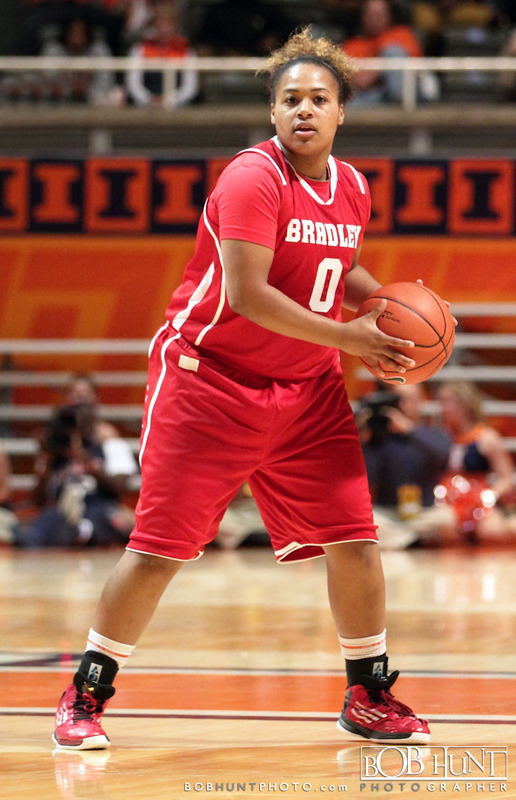 Alexis Smith joined the duo in double figures with 10 points and a game-high eight assists. 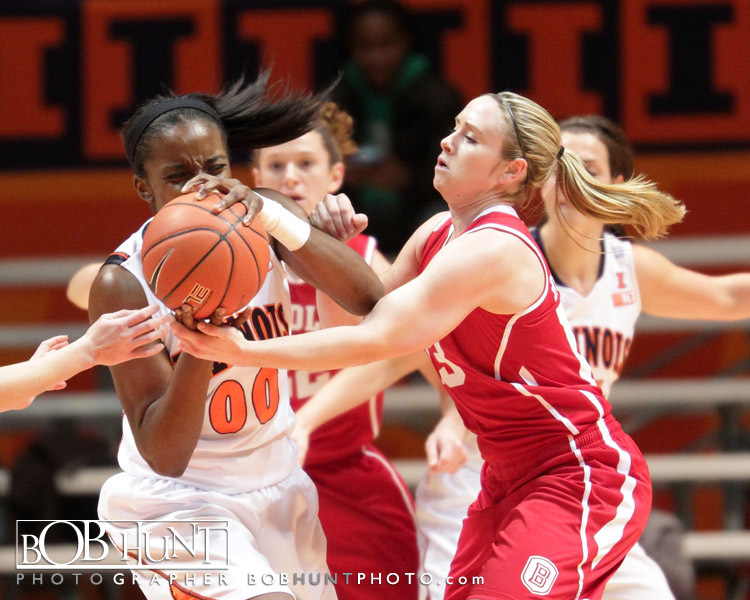 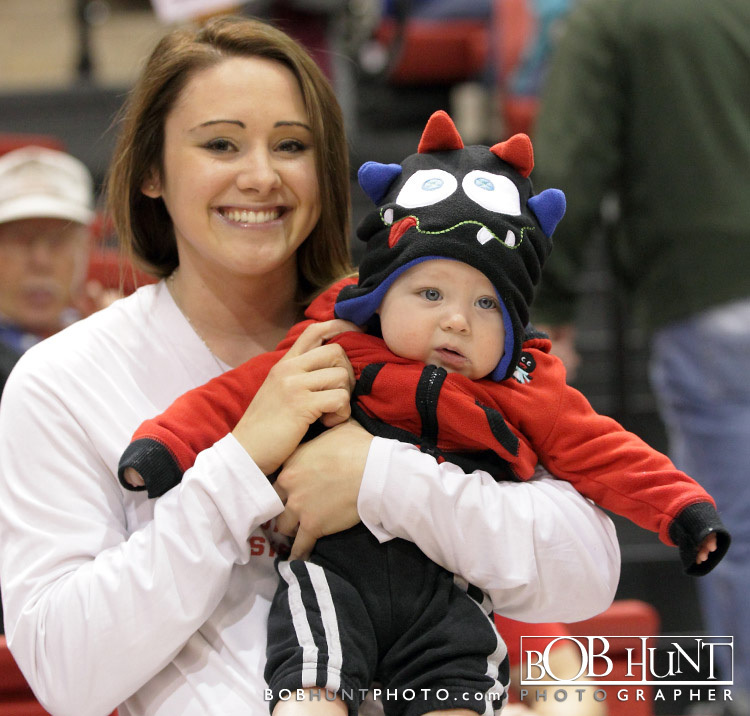 Click here to view more game photo’s.